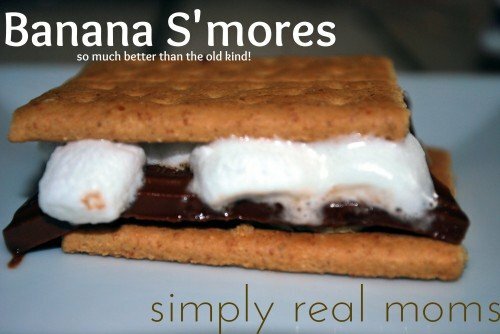 Banana S’mores: A New Twist on a Classic Treat! Until meeting me, my husband had never had a s’more before! When he told me that, I almost fell off my chair! It was hard for me to imagine, considering I am a bit of a s’mores addict. There’s just nothing better than the combination of graham crackers and chocolate—I crave it every summer. I wanted to let my son try s’mores, but felt a little guilty about the lack of nutritional value. So I decided to try adding bananas. OMG. 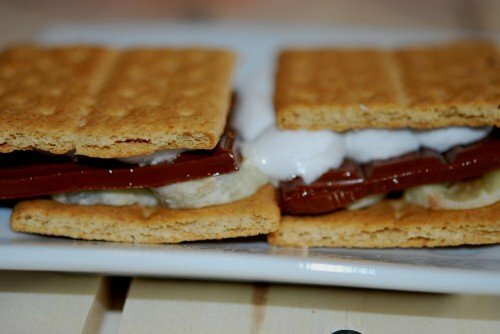 I had no idea this delicious treat could get any better; but now I will never be able to have a s’more any other way—so simple, but so much better than the old version! Moms, this is a great way to add something healthy to a delicious treat! Step 2. 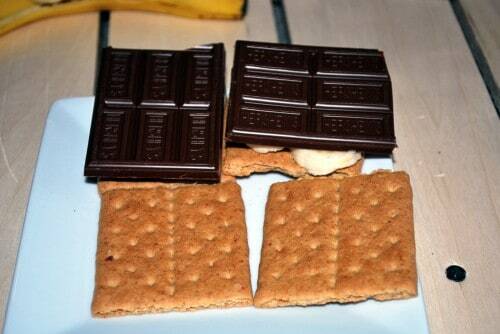 Thinly slice banana and place a layer on the bottom of one-half of the graham crackers. Step 3. Break each Hershey’s Bar in half and place on top of sliced bananas. Step 4. Roast marshmallows and place on top of each chocolate bar (if you don’t have a fire available, just place s’more in microwave for 20 seconds). Step 5. Cover with the tops of the remaining graham crackers to create a sandwich. Enjoy! Banana S'mores: A new twist on a classic treat! Try these s'mores for a new spin on an old classic treat! 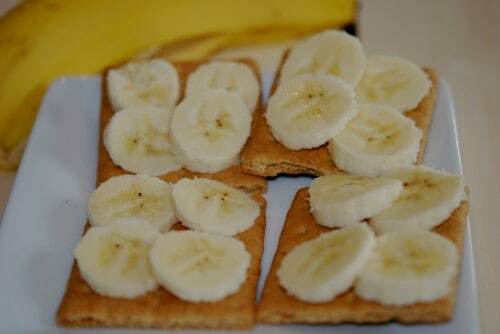 Thinly slice banana and place a layer on the bottom of one-half of the graham crackers. Break each Hershey's Bar in half and place on top of sliced bananas. Cover with the tops of the remaining graham crackers to create a sandwich. Enjoy!! Treat.com Wants To Give Our Readers a FREE Card! Elvis would be proud lol. In all seriousness can I just say….YUMMO!!! !